Just when I think I have enough hammers to meet my studio needs, I discover a new one! You know how it goes with tools. The hammers you see perched on the wall include forming , chasing, raising, texturing, forging, ball peen, riveting, and planishing hammers. Then there are the mallets – brass, nylon and rawhide. If you are new to fabricating sheet metal please don’t feel you have to have a hundred hammers to make a bracelet. There are many wonderful designs you can create with basic tools. 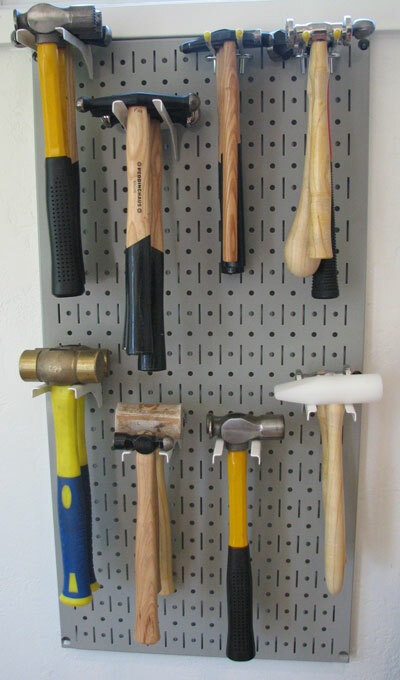 Hammers, and many other tools as well, can be gradually added over time.